Castle Noland was hand built by the Noland Family themselves over the last 25 years. The design was inspired by Architecture, Art and Travel to the most famous places in the world. Filled with European antiques with each room unique. This traditional home hardly has a straight wall adding to the intrigue and beauty. Made of Stone, Imported Spanish Slate, and hand hewn Oak Floors, hand painted mural walls and ceilings adorn many parts of the interior. 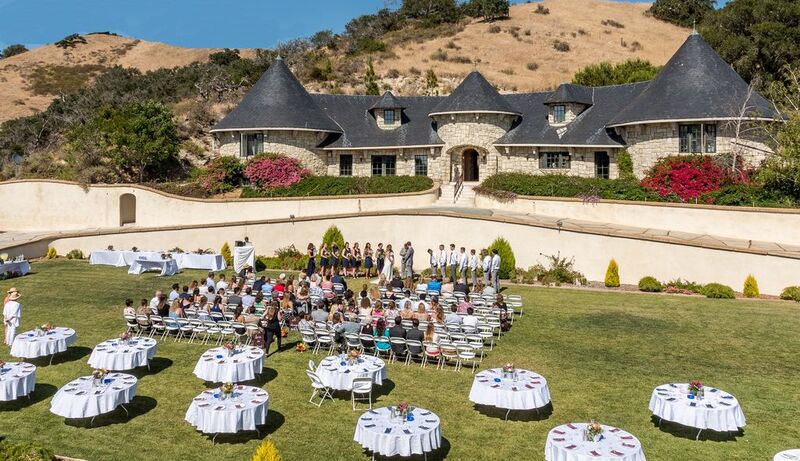 Set on a 22 acre estate featuring a carriage house and rolling pastures set in beautiful temperate ocean climate of Avila valley, the wonderful beach towns of Avila and Pismo are an easy bike ride away. San Luis Obispo, 10 min. North, has been repeatedly voted the number one small town in America. Come join us for a wonderful, peaceful weekend. We built Castle Noland for our family Home over the last 30 years. We love to Travel, Dance, Hike, and just enjoy the Blessing of our wonderful world and lives. Building Castle Noland has been a 30 year creative project for our Family. Many Friends have said "Its more like a work of art than a house"
We love the chirping Birds in the Morning, the wide open spaces and the "SLO" life. San Luis Obispo has been repeatedly been voted the #1 small town in ALL America. San Luis Obispo's thursday night farmers market is renowned throughout California, Beautiful old mission and downtown voted top happy place to live in the US. San Luis Bay (time share) Resort at Avila Beach. There are 7 golf courses within 20 miles. the nearest is "Avila Beach Golf Resort" 4 miles away. Beautiful rolling California Oak Studded Hills, fantastic hikes and Mtn. bike trails of all levels within 20 miles, some as close as .5 mile. I had my 50th birthday party at Castle Noland and it was a great venue. The home and grand lawn offer many settings and options for hosting family and guests. We had the venue for the whole weekend. We had a smaller gathering at the house on Friday evening, a large outdoor party Saturday and an intimate family gathering on Sunday. My whole family stayed together at the house. The kitchen and living area are open floor plan and are designed to encourage gathering around the large kitchen island and cooking and eating together. It suited our large family very well. Chad and his staff are very responsive and helpful. They were quick to respond to detailed questions and coordinating logistics and upon request helped party set up and break down. They were swift, responsive and communicative, which is what you need when planning a large event from a distance like I was. A beautiful place to stay. So unique where you can imagine living in a real castle. My son got married around the corner at a vineyard - but all weekend we had family and friends stop over to visit and spend time with. The weather and this location made a weekend my family will always remember! Thank You! From the photos I was afraid of a This Is Spinal Tap Stonehenge experience but WOW! Words fail! From reservations through our 4 night stay, Chad, our host/owner/builder, was totally professional. The grounds are beautiful, the location is perfect, and the castle is unbelievable. The result of 25 years of love and attention to detail, this place has to be experienced to be believed. We are already planning our next visit. Mid-week rates make this perfection affordable. Everyone deserves an experience like this, at least once in a lifetime! Castle Noland did NOT disappoint. We had such a wonderful time there. We will be back again for sure! Castle Noland was a wonderful place to stay for our family. We were celebrating my 75th birthday and had rooms for my wife and I, my sister and her husband and my older son and his wife. Each room had a comfortable king sized bed and each room had a personality and uniqueness. Our younger son slept upstairs in the secret room and had to use a small bathroom downstairs off the kitchen. He didn’t rave about his space but it helped to assure we were there together. We invited my other brothers and wives for dinner as well as three of my wife’s cousins and had room to seat 18 for dinner although had 17. It was never crowded, and a beautiful place to have such a fun family get together. Our hosts Brad and Rainy were very responsive and provided extra plates and cutlery, a coffee maker and knives. We enjoyed the Irish room, my sister and her husband were in Paris Country and my son and his wife were in the Kings quarters. Great fun for all of us in the warmly furnished living room with a huge chandelier and fireplace. We thoroughly enjoyed our family vacation at Castle Noland! Three fabulous bedrooms, a huge kitchen, dining and very comfortable living room. This is a perfect place for 6 adults (and kids). We had breakfast on the patio with lizards and we slept with a warm breeze from the lace covered windows. No cable but we enjoyed Netflix every night.